This item is a cross-posting from my Growth Mindset Memes blog. To find out more, visit the blog: Pay attention and stretch your knowledge. This growth cat is inspired by a quote from Carol Dweck's book Mindset: "Only people with a growth mindset paid close attention to information that could stretch their knowledge." The image comes from Cheezburger. I've written a short essay about this one which you can read below. 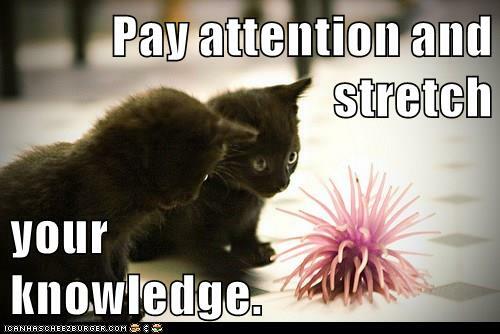 Pay attention and stretch your knowledge. The context is a study that Carol Dweck conducted comparing people with traits of a fixed mindset to people with traits of a growth mindset, looking for how people respond to feedback about performance. This is an incredibly important topic for teachers and students, so I will quote that section of the book in full here. This is the kind of finding that reinforces my conviction that grading is one of the biggest problems with traditional schooling: by focusing only on right/wrong instead of feedback for growth, we reinforce the self-limiting habits of the fixed mindset. You can even see the difference in people’s brain waves. People with both mindsets came into our brain-wave lab at Columbia. As they answered hard questions and got feedback, we were curious about when their brain waves would show them to be interested and attentive. People with a fixed mindset were only interested when the feedback reflected on their ability. Their brain waves showed them paying close attention when they were told whether their answers were right or wrong. But when they were presented with information that could help them learn, there was no sign of interest. Even when they’d gotten an answer wrong, they were not interested in learning what the right answer was. In the Fall of 1999, I was teaching what was for me a large Mythology class (50 students), and the students had turned in a short paper at the beginning of the semester; this was back when I taught in a classroom, before I started teaching online. I knew I could not write extensive comments on that many papers, but at the same time I was dismayed by the quality of the papers: some of the papers were very good but some of them were in pretty bad shape (it was my first class at the University of Oklahoma; previously I had been a graduate student instructor at UC Berkeley). So, I didn't know what to do, but it seemed like a good opportunity for an experiment. I told the students that they could choose: I had graded the papers and would give them back with the grades on them but no comments, or I would write comments on the papers on the condition that the student then revise the paper — but not for a better grade; it would just be an opportunity to work on their writing in order to improve it. In that class of 50 students, exactly one student asked me to put comments on the paper so that he could revise it. All the other students simply wanted to get the grade and move on. That little experiment showed me that the students really were focused on the grade and they had come to my class to get a grade; learning was not their primary goal, even though many of them really did need help with their writing and were surely aware of that fact. Since my own goal really was to help students with their writing, I realized that I needed to do something dramatically different in my classes; to find out more about how I changed my teaching practice completely, see this post: The Shift from Teaching Content to ... Teaching Writers.